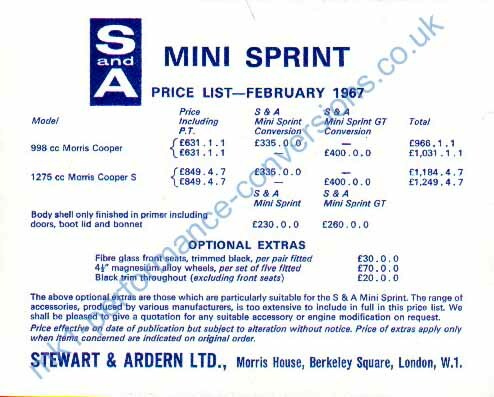 The first commercial manifestation of the legendary Minisprint. Read what the originator of this classic Mini variant had to say about it. The rare brochure is courtest of Stephen Dalton. 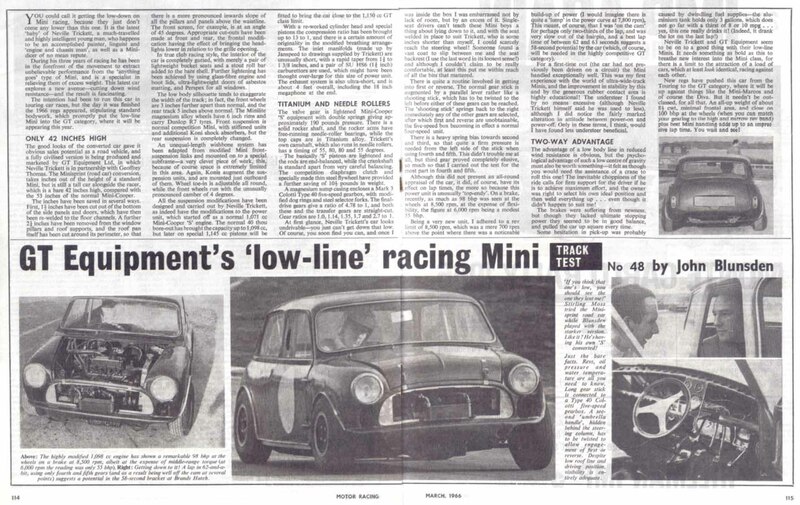 Read more about Neville Trickett & the Minisprint HERE. 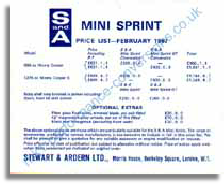 Although not the first company to market the Minisprint, Stewart & ardern made the best attempt at selling it. 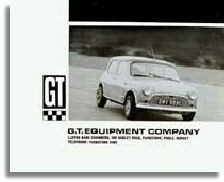 They were the biggest, BMC agents in the London area and decided to go into limited production of this cut down Mini. Available in two sizes, low & lower, it's biggest problem was always the horrendous cost of modifying the shell by hand. 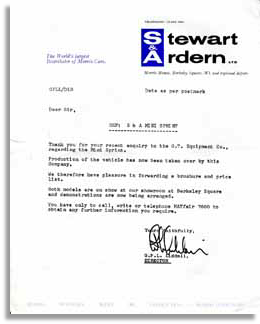 You would even get a Stewart & Ardern KEYRING with your new purchase. 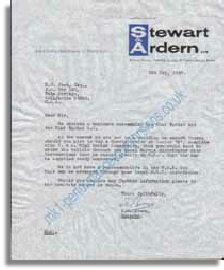 As well as the catalogue, I have managed to add a copy of the covering letter & a copy of the price list sent out to potential purchasers in 1967. 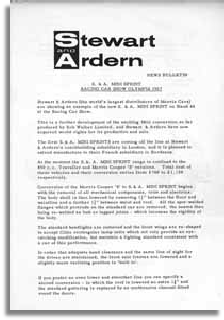 And at the bottom you will find a full copy of the press release issued prior to the 1967 Racing Car Show promoting the new "range" of Minisprints that were to be displayed there. Click on the thumbnails for large scans. 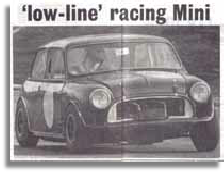 I have recently discovered that GOY 764 D The Stewart & Ardern Mini Sprint GT featured in the accompanying advertisements was subsequently sold to the United States where it had a very successful club racing career for many years. 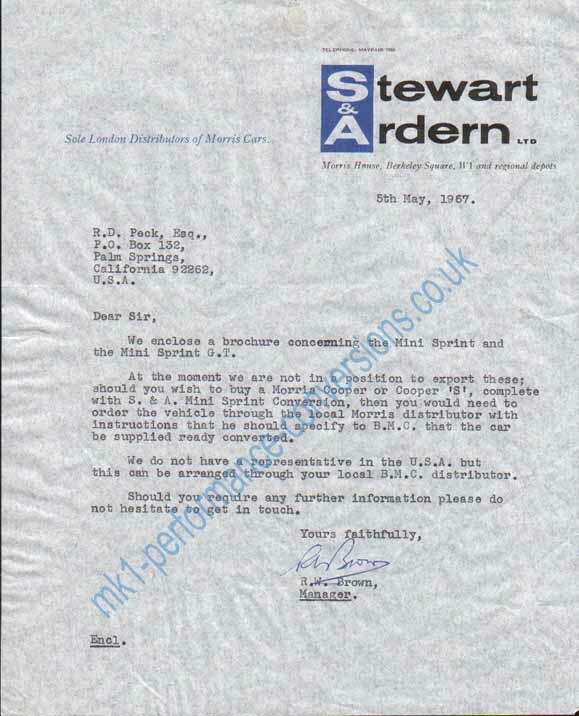 Over the period it was modified many times & was eventually scrapped. The original badges that GOY was sold with back in the late 60's. Unfortunately they are the last remains of this interesting Sprint. I still have a few original parts as well as many good memories, same old conspirators as friends even today. 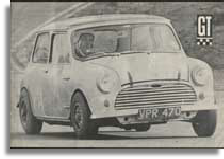 My car (GOY) was featured in CCC July 1967. 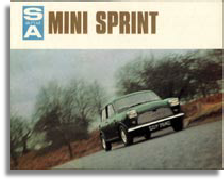 I’ve got the magazine and it shows the car with no S&A badge or Mini Sprint GT letters. They were located in the centre of the front hood where a regular badge would go and in the rear where on a MK 2 the 1275 would go. I started f-ing up the sprint immediately and removed and filled all the holes then i radiused all 4 wheel wells to fit the big wheels and tires and Grp 5 flares.